A very impressive bank robbery thriller with a mastermind plot. This is a smart, twisty, and fun bank robbery movie. It is loaded with energy, from the witty detective Keith Frazier (Denzel Washington), to the crafty bank robber, Dalton Russell, who has it all figured out (Cive Owen.) There are so many angles to this thing that the movie is able to spin you for loops, make you think you have it figured out, and then continue to shock you in ways you never saw coming. Everyone is brining their top game to this one, including Jodie Foster, who shows up as a sort of fixer, with an agenda of her own. For Spike Lee, the movie is a crowning achievement in directing. Yet despite the movies style and flair, it’s the way the whole puzzle of a plot fits together so flawlessly that is the real work of art out on display. 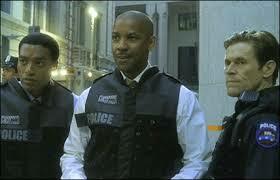 Inside Man is Spike Lee’s biggest movie to date (meaning his movie that made the most money.) It is also one of his best. Now, obsviously this is the guy who made Do The Right Thing, back in the late eighties, and there’s no getting around the fact that it was clearly Lee’s best film. But once he started expanding as a filmmaker, leaving the projects and the hood, and pushing himself past areas that he was comfortable with, he really hit is stride with this one. It started in 1998 with Summer of Sam, and continued through The 25th Hour in 2002, all the way up to this movie in 2006. This was his most mainstream film (Brian Grazier produced it and Ron Howard was supposed to direct, until Russel Crowe called him away to make Cinderella Man.) The movie did so well that there was even a sequel proposed and put into the works, but it never happened. Thank goodness for that. Inside Man, as a movie onto its own, will stand the test of time of one of the better, smarter, and cooler bank robbery movies around. The film is all about style. It hits us with that notion right at the very beginning with an opening sequence that shows Clive Owen’s bank robber talking to the camera, breaking the fourth wall, and explaining the basics of his plan. He really just gives us the who, what, when, where, why, and how. Most of it is pretty straight forward, and yet it is all kind of cryptic. It might sound simple, but its because he’s telling us so little that we wonder and what to know even more. The movie jumps right from that to a great Bollywood song which plays over the opening credits of a van driving from Coney Island, Brookly to Wall Street, Manhattan. This is the van of the robbers, dressed to look like a painters van, and when it arrives, we follow our villains into the bank. They are all dressed like painters and completely disguised so that for a while, nobody in the bank can even tell that something is wrong. That’s when we enter the bank and start meeting some of the customers. 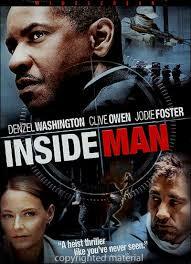 Clive Owen uses a flashlight to black out all of the cameras, and the other painters start to move equitment in. No sooner do they attempt to do this, does a security guard stop them. And that’s when the robbery begins. They jump on the guard and then hold their guns in the air and start screaming demands. Mainly that everyone gets down on the floor quickly, and that if anyone tries to be a hero, they will receive a gunshot to the brain. Every one of these robbers is wearing a mask, and so there is no facial recognition going on here at all. This brings in Detective Keith Frazier (Denzel Washington), and his partner, Bill Mitchell (Chiwetel Ejiofor, before he became big.) They are sitting around the police station, joking about a few things, before they get the call. And even when it comes across their desks, they can’t imagine its for them. There’s another guy who usually takes these kinds of things, only this week he is on vacation, and so now Frazier is up. He heads over to the site of the bank and starts getting to work. We now begin to watch both the inside and the outside of the bank, as two sides of the coin. On the outside, we are with Frazier as he meets the police captain, Darius, (Willem Dafoe) and starts discussing the scene. On the inside, we are with the robbers and their hostages. These robbers are smart. The first thing they do is bring everyone down to the basement floor and then separate the bank employees on one side and the customers on the other. Then they start collecting cell phones. They collect those that belong to the bank employees first. When one man doesn’t turn in a phone, the female robber raises her hand. The main robber, Dalton Russel, (Owen), comes over and asks the questions. That’s because they have it planned so that he will be the only one of the robbers who speaks, for when the customers are questioned by the police later. He now uses the other phones in the bag, of the other employees, to find out that this man does indeed have a cell phone on him. Every bit of this is calculated. Separating the bank employees, collecting their phones first, using another employees phone to try this guys phone, and finally, bringing him into a room with glass, where everyone can watch him get beat up and made an example of. This is but the first of many smart moves by the bank robbers. Another one involves bugging that goes on between them and the police. The bank robbers demand food, so the police send in a bunch of pizza boxes with wire taps on them. Only the bank robbers are one step ahead and use a recording of some Albanian dictator to throw the police off and help waste a lot of time. The robbers have a plan, and stalling for time is a major part of it. This tape is just the start of that. Aside from the robber, the customers, and the police outside, there is also another major player involved in this. There’s a man named Arthur Case (Christopher Plummer), who owns the bank. He is the man who built the place from the ground up, and he’s got a major problem with something he left inside. Case hires Madeline White (Jodie Foster) to go in and get it for him, only this involves calling in a few favors. She starts with the mayor. That leads her to Frazier and to getting into the bank and speaking with Russel herself. This may all seem like a sideplot, or a red herring, but it happens to be very crucial and clever plot twisting, slowly taking form. There’s plenty more where that came from. This movie is about outwitting and outsmarting, and nearly all of the time, it’s the bank robbers who are one step ahead. The movie is also really put together nicely, structured in such a way that we watch the detectives questioning the different customers, one at a time, throughout the course of the film. These are all flash forwards, of course, and they keep asking the people if they are the ones who did it. We only find out the reason for this, and why the detectives really don’t know, at the very end. In the meantime, we get Spike Lee really digging hard as a director. This movie is all about New York and it’s citizens. It is about the culture of New York, as witnesses by the many interviews that go on between the detectives and customers, many of whom are from mixed backgrounds. There’s a lot of racism here, but it’s not white on black racism. Instead, it’s cultural, and it is meant to be realistic. Sometimes it’s a bit much, but it never takes away from the story, and instead, only falls into the background. It’s the story itself and the amazing twists that really hold our attention. There’s a reason why long after the robbery is over, nobody seems to care anymore, and nobody, including Arthur Chase, seems to want the robbery to be solved. Everything ties together nicely here, including the great performance by Washington, Owen, and Foster. All of these actors are on top of their game with this one and the movie is a major achievement in bank robbery movies, heist movies, and genuine suspense.